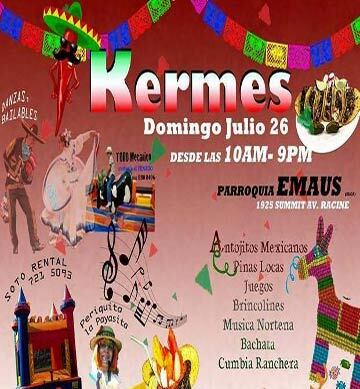 Emmaus and Emaús Lutheran Churches, 1925 Summit Avenue in Racine, will celebrate Kermés together Sunday, July 26 with a bilingual worship service at 10:00 a.m. and a funfair from 11:00 to 8:30 p.m. The funfair will offer food, games, music, and information on health, fitness, legal and financial services, and more. Kermés is a Mexican tradition borrowed from the Dutch. The word derives from the Dutch words “kerk” (church) and “mis” (mass), originally denoting the mass said on the anniversary of the foundation of a church and now incorporating a sense of community celebration. Six years ago on Pentecost Sunday, the Emaús Spanish-speaking worship service began under the leadership of Pastor Jhon Freddy Correa. The initial community, which first met in homes, was made up of 25-30 people. The Sunday attendance now fluctuates between 100 and 200 people weekly. Emmaus traces its origin to a small group of Danish and Norwegian Lutherans who established The First Scandinavian Lutheran Church of Racine on August 22, 1851 in the home of John Lawson. The congregation’s first pastor was Rev. Ole Andrewson, from 1851 to 1853. Sunday services were held in Danish until sometime during World War II; English services were not offered weekly until 1923. Emaús and Emmaus hope you will come to celebrate the history and richness of diversity of the congregation.